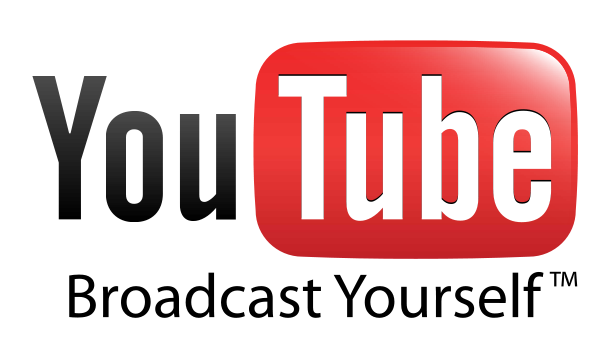 Youtube is very popular video database site. If you are a regular user of youtube, you would have observed some bugs from the youtube interface. It might be either the full screen error, Or Restarting the Videos, Flash Videos hanging always, Slow Streaming of videos even with a good connection and so on.. But for every problem, we gotta find a solution. Today i want to talk something which is really annoying with Youtube videos. This problem will make your youtube videos to restart when you click on full screen option. You can see that the video is really loading pretty fast, You can able to see it running fast while playing the video. But when you click on the full screen video, BANG. All the streaming which has been done before will be gone in seconds. Its really very annoying each and every time when you do this. You might also observed that this happens only some times with some videos. The reason for this problem is that you are changing the screen resolution each and every time when you click on the full-screen. Confused? Okay let me explain you clearly. Whenever you are seeing some videos in youtube, you can observe a small icon left from full screen option. where it says 240p, 360p, 460p, 720p and 1024p. These are the screen resolutions of that video. Files upto 460p are FLV files, and Files from 720p are MP4 files. Each of these files are different in size and different in clarity. Ever since YouTube has changed its interface to a new one, we found some bugs which are being resolved as soon as possible. Now to over this annoying problem of restarting the video all you have to do is to make some some small changes in your youtube account settings. I hope you all are using Gmail account, which can also be accessible to other services like youtube without separate account. Now just login and follow my instructions given below. First Login to your YouTube account. Click on your name above which is your login id, and click on Account. Now look for Video Playback Quality option. You can find two options, and you can observe that the default option has been set as Always choose the best option for me based on my player size. and also Always play HD when switching to fullscreen (when available) is Checked. Now select the I have a slow connection. Never play higher-quality video option and save changes. 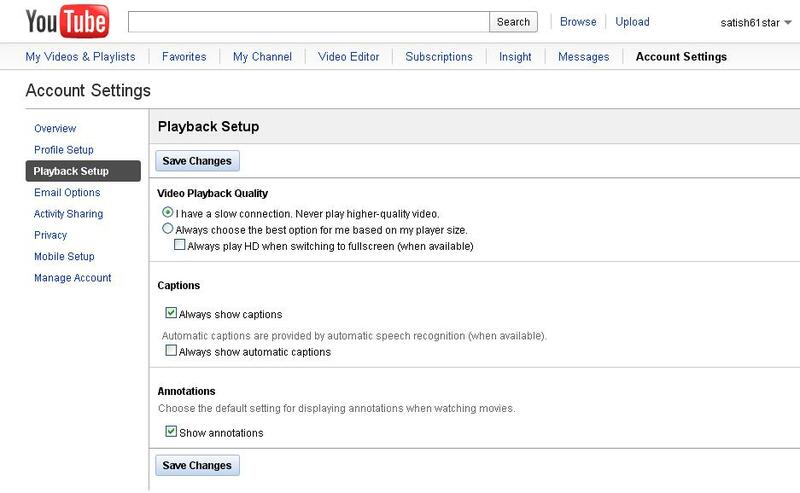 Now you can stop youtube videos to restart whenever you click on a full screen option. Each and every time when you load a video, the default will be 360p resolution. Even after you have clicked on full screen, it will be 360p. Earlier it was a bit annoying, like for example if we have a video in 2 different formats, like one is 350p and other is 720p, then whenever you click a 360p video to watch in full screen option, it will be shifted from 350p to 720p resolution automatically. This make the video to load again from beginning and start annoying us. With this simple trick you can enjoy your streaming very easily and happily. One more simple trick to make your flash youtube videos a bit faster is to change the Adobe Flash Player 10 Settings. All you have to do is to simply change a small setting. Just go to the video which you are streaming right now and right click on it to see a option called Settings. If you click on that you can see a small option called Enable Hardware Acceleration. Uncheck that option and continue with your video. You can find that video has been a bit faster than it was earlier before. That’s for today.Please leave a comment if you are lost some where. I am regular user of youtube and for me sucgh tips matter a lot !! keep rolling such post ! thanks a lot! I don’t use youtube much but when ever i use it i never use full screen mode. I think i have never used it any time in my life. BTW nice post who are suffering from this………. Your theme is stunning and this youtube trick is super 🙂 which i need very much. Kind of frustrating when i use youtube and your tip really a great time and bandwidth saving too. Thanks for this tip bro.. It works…! Sometime I watch YouTube video in full screen mood but most of time I watch in default mode. I’ll keep it remember when I watch next time. superosuper i often had this problem bt now no props at all…n im using maxthon browser n many other tips mentioned in this site!! !thanx 2 coolpctips!! !its an awesome website!!! great man you are to good. I just created a petition entitled Youtube: Disable resolution change when switching to fullscreen mode, because I care deeply about this very important issue. I’m trying to collect 20000 signatures, and I could really use your help. I face this problem even after making changes to account settings. But I’ve discovered that it only happens in Chrome NOT in other browsers. So I simply switch browsers to Firefox for watching videos. Feels a lot easier than getting frustrated with the screwed up settings!